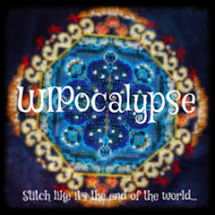 Record breaking month for April - EIGHT different WIPocalypse projects got stitched this month. April - What projects are in your UFO pile? 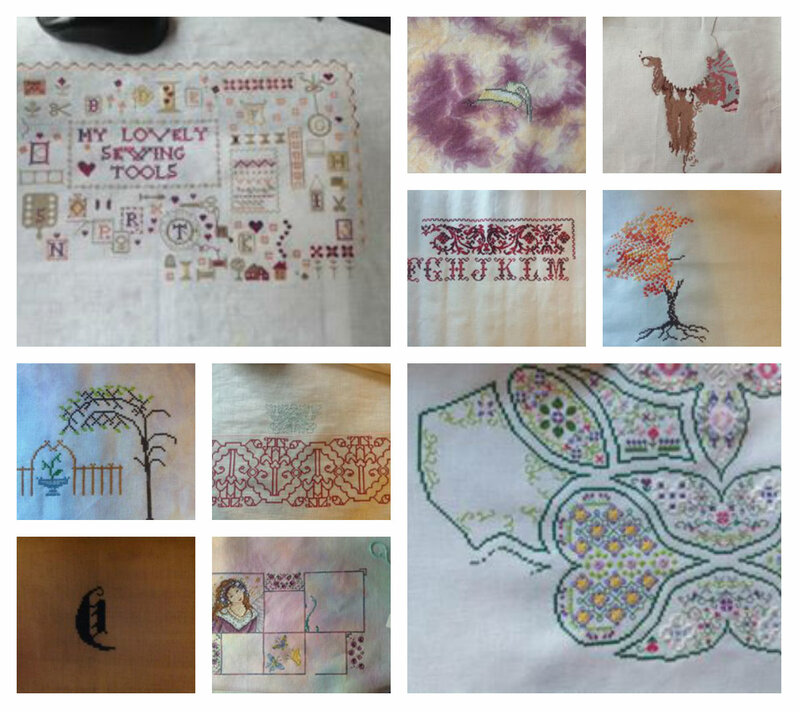 Bandes des Dragons by Dessins DHC - I will finish the top border, cut it out and call it done! There are some real BAPs in that collection so it will be many years before I finish them all! I will be doing the Longest Day Marathon again this year, if anyone wants to join me. Here's the monthly pie with Gathering Honey taking most of the month. The BB Alphabet took a lot of time because U was full coverage and I did V in April too but can't show you until Saturday! Finally, Stitch from Stash. What a month! That's cheaper than a skein of DMC at the local craft shop. It hasn't arrived yet but I will show you when it does. I have a weakness for stitching books and have been thinking of adding a page with them all on. Would anyone be interested in that? Front cover, ISBNs and a photo of my favourite project from the inside. I substituted satin stitches for the beads. The K is from my spooky conversion of Lavender & Lace's Enchanted Alphabet. I'm stitching it all in DMC 310 on 32 count Tiger Lily Murano from Sparklies. I won't be stitching the flouncy girl or the rabbit but will be adding lots of bats, pumpkins, spiders and other spookiness. 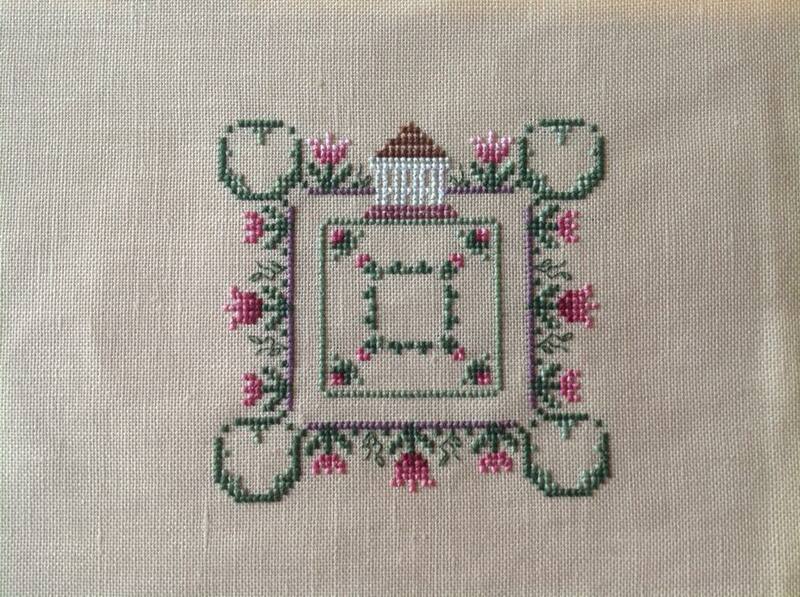 On the left is Joan Elliott's 12 Days of Christmas and here's the part I have just finished; the top border. I needed a break from all that metallic! I am a little bit disappointed that I didn't quite finish the bees, I had to work a full day this week which left no time for stitching the backstitch! Which of course means I must have finished the previous Thirty-a-Day project! 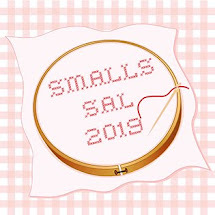 I think I'll save that for the Smalls SAL post on Friday. Give you something to look forward to. Congratulations to Mary! I shall be looking around your blog to decide what to send you as a suitable prize. The Mystery Phrase was guessed by everyone this year - The Earth Laughs in Flowers - a phrase from a poem entitled Hamatreya by Ralph Waldo Emerson. For those of you unfamiliar with the poem, here's a link to the full version - Poetry Foundation - and here's a link to a blog post talking about the meaning behind the poem which is rather interesting - Karen Joslin. My initial thought for a suitable prize was a chart with the saying on it. So I Googled the phrase and guess what came up? Yes, a free chart, so a prize for everyone who entered! Just click on the link above to download the chart. I have deliberately made that picture small so you go and visit the source. In addition to being entered into my Easter draw, all the participants got additional entries into my Blogaversary draw (if they followed the instructions on that post). That draw is still open, until the end of the month so you've got time to enter if you haven't already. Just visit my Blogaversary post and follow the instructions. Finally, the Blogger of the Week blog is doing so well. I just love reading all the answers and looking at the beautiful stitching. If you would like to be featured, please send me an email. If you know someone who is too shy to volunteer themselves, then send me their email or blog address! What a surprise - four calling birds arrived this morning. They are very sweet, even if they do call rather loudly - they make telephoning impossible. But I expect they'll calm down when they get used to their new home. Anyway, I'm very grateful - of course I am. Joan Elliott has gone for the modern Calling Birds (1909 version only) rather than the traditional Colly Birds (1700s onwards) which are blackbirds. I expect she liked the blue rather more than black! If you are interested in the different versions, check out this Wiki page - The Twelve Days of Christmas. Two versions have Canary Birds, some have Coloured Birds and one has Ducks Quacking (1864), so Emily got off quite lightly there! I have decided to stitch all the background parts of each block with just one strand so they don't overpower the main feature. 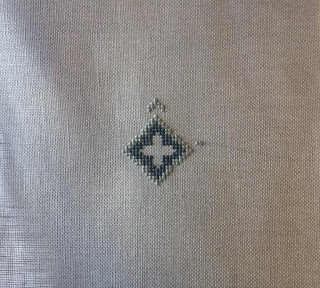 I also changed the French Knots to tiny over one crosses to make them more even. Here is the whole piece so far. I have stitched all the red on the second Angel and will continue the border this month. April Showers - What pieces do you have that contain water? It might be rain, river, sea or lake - see how many stitches you can make! We need a gigantic shoe-horn for this one, nothing watery at all unfortunately. The first piece is my Just Nan So Many Stitches project. 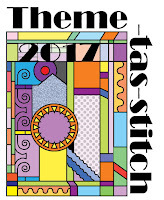 I started this as part of March Madness for Theme-tas-stitch and then have continued to put 30 stitches per day into the project. Today I added some Ice beads. Ice is frozen water. This is Just Nan's Spring in the Square - Day 112. 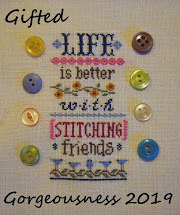 So that's 1,120 stitches doing just Ten-a-day for the FB challenge. Recently I've been adding lots of colour to the flowers. This is Gathering Honey by Jannlynn. 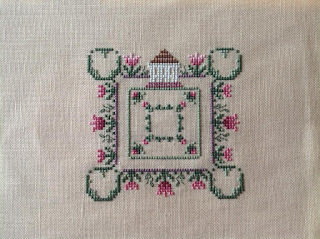 Last time I stitched on this I completed the top left hand corner which was very time-consuming with all the colour changes and fiddly fractionals. This time I have finished the entire border (yay!) and the top right corner. And then added the honeycomb around them. For the bottom left corner I will backstitch the bees after the honeycomb because some of their legs got a little lost doing it first. The honeycomb is three strands of thread and the legs are only one. Hopefully I can complete the bottom left this month and then focus on the bottom right next month. That's more fiddly flowers. Then there's some writing to add top and bottom and it's done! So if not a May finish, then it should be one for June. Finally, thanks to everyone who took part in the Easter Treasure Hunt Blog Hop. The competition is now closed and I will be drawing and announcing the winner in my TUSAL post on Wednesday. My Blogaversary draw will continue until the end of the month. Don't forget, anyone who links up for GG gets an extra entry into that draw. Welcome to the April link-up for Gifted Gorgeousness. The linky will stay open until the end of the month so you have plenty of time to join in. Once again I have a good mixture of gifts to and from people to share with you. First up is a finish which is a gift for my cousin's baby Mary. We went to visit my cousins last week and Mary was suitably uninterested in her gift but that is because she is only 100 days old! Her parents loved it and I am sure she will in time. She did appreciate an Auntie Jo cuddle which was nice. blue and purple fabrics included to try get colour to show accurately! 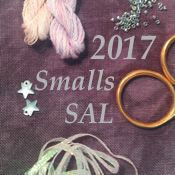 We travelled by train to visit my cousins, six hours stitching (3 there and 3 back) saw the bulk of a new start done and another two days at home saw it completed. birdies and bunnies and sheepies! I stitched some boring border and started some bees! Two of the corners have complex floral patterns which take ages to stitch and the other two corners have bees and a honeycomb which should be much quicker. 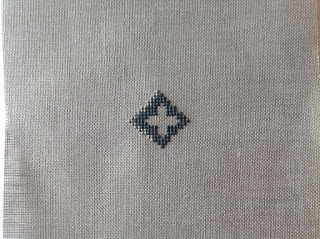 Once you decipher what colour the backstitch is supposed to be! And last of all, a gift for me! 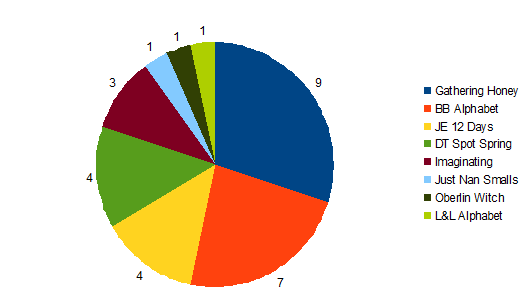 I won Vickie's giveaway by default as no-one else wanted to tackle the Kingsland chart. 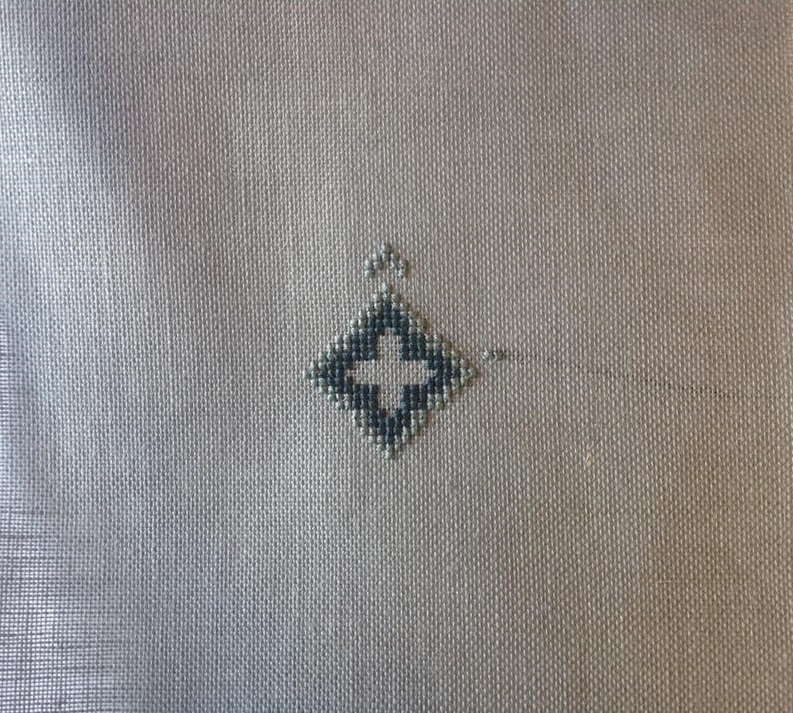 It needs three different fabrics, one to stitch the main centre design, another to stitch the border which is then folded around a mat and a third to stitch the hardanger heart which you cut out and attach to the centre. A great focus project for one month next year, it's going on my "18 in '18" for sure. The other chart is a Just Nan band sampler I don't have. 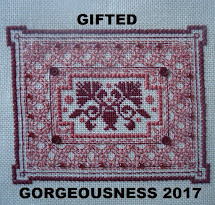 It's got 12 bands so I am thinking about making this a monthly GG stitch. If I did this for every JN band sampler I own I would just about finish them by the time I reach the age I mention in my header! And now it's over to you. This is where you link up your post for this month. Please use your name or your blog name in the field and NOT the words "April Update" so I can easily see who has linked up this month. And link to the actual post, not just your blog. It is easier if you copy and paste the link, rather than typing freehand. Finally, the Easter Treasure Hunt Blog Hop is now up, as is my Blogaversary giveaway. There is a prize for each and anyone who links up for GG gets an extra entry into the other competitions (if they have entered them). So please spend some time this holiday hopping around to meet other bloggers. Welcome to this year's Easter Treasure Hunt Blog Hop! I have a great line-up of blogs for you to visit and collect a letter from each one. The letters will form a short phrase if you visit them in the listed order. Or you can be clever and visit them out of order to get an anagram! Remember time zones so some people may not have posted if you are hopping early in the day on the Eastern side of the Atlantic Ocean. When you have finished hoppity-hopping and have the mystery phrase come back here and leave a comment. 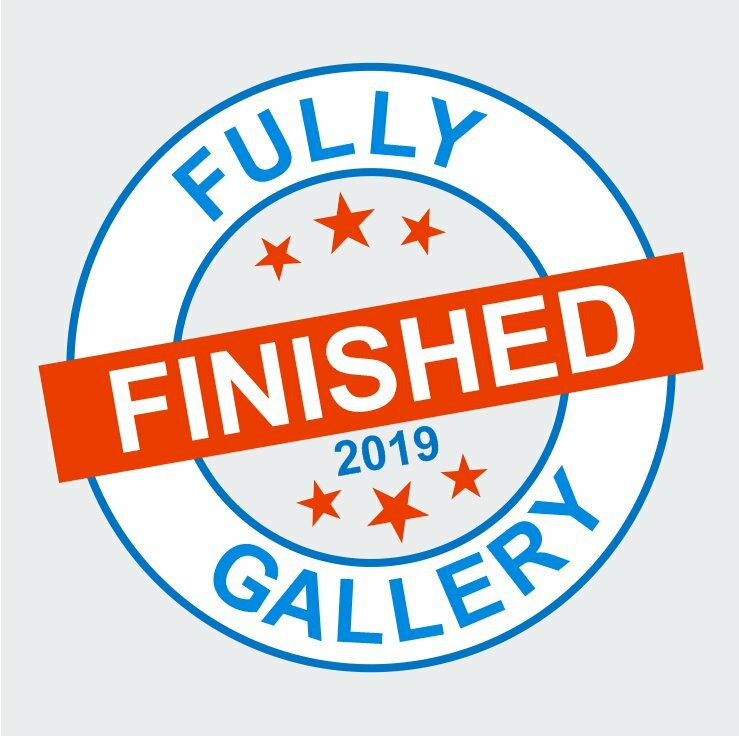 All commenters will be entered into a prize draw, all picture posters get an extra entry and anyone who has already entered my Blogaversary giveaway (see previous post) gets an additional entry into that draw! You have a week to enter this competition, I am moderating comments until the 21st April so you can't copy each other LOL. The backing and side fabric is an upholstery sample. Several years ago a box of fabric sample books were dropped off at the church where I run my Toddler Group. The cushion-makers took their pick and I got three books which were left. 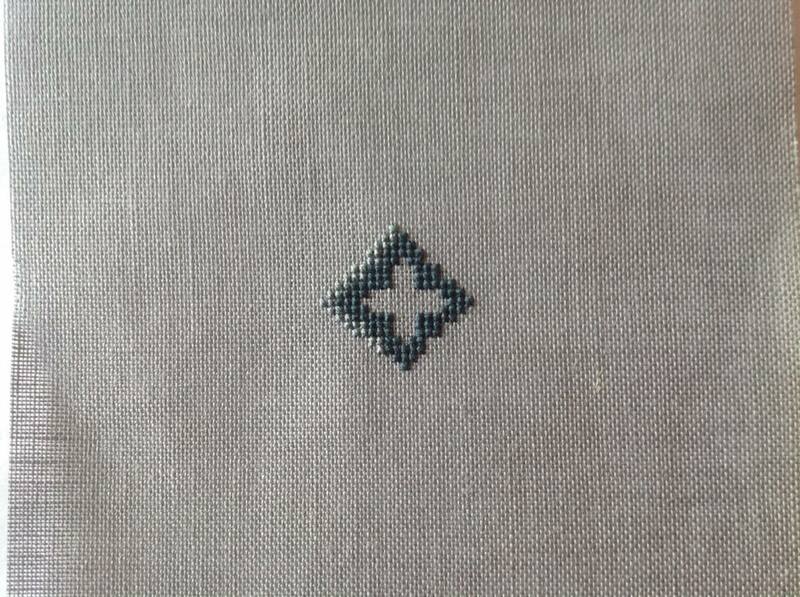 This fabric cost £75 a metre according to the book! Finally, we have a new Blogger of the Week so don't forget to hop over there and find out who it is this week.